The incredible advances made in mobile phones, tablets, laptops, electric shavers, sat-navs, bike-to-bike comms, drones, power-tools and countless other battery-powered gizmos and gadgets over the last decade or so we all now seem to take for granted. If you’re like every other punter out there, unless your next phone has three different camera lenses, an even higher quality screen, less weight, and more battery life, you simply won’t be happy. But what’s interesting is none of this relentless march forward in technological sophistication would be possible without equivalent progress being made in battery technology, because all this techno-wizardry needs feeding with power. Just as silicon chips have gotten more powerful and capable, battery technology has been moving packing ever greater amounts of power into smaller, lighter and more funkily-shaped spaces, making that A11 Bionic chip in your iPhone X sing all day long. And the good news is that now your bike is set to benefit from all of this too. If you pop down to your dealer for a new battery, chances are that they’ll be flogging you a Lithium-Iron battery, rather than one of those old lead-acid thingies that we’ve all been using since the 19th century. Some bikes are now rolling off the production lines with Lithium Iron batteries fitted as standard – Honda’s Fireblade SP and Ducati’s V4 and 959 Panigale Corse immediately spring to mind. “But why?”, you ask, “what’s wrong with good old lead-acid?”. Good question. 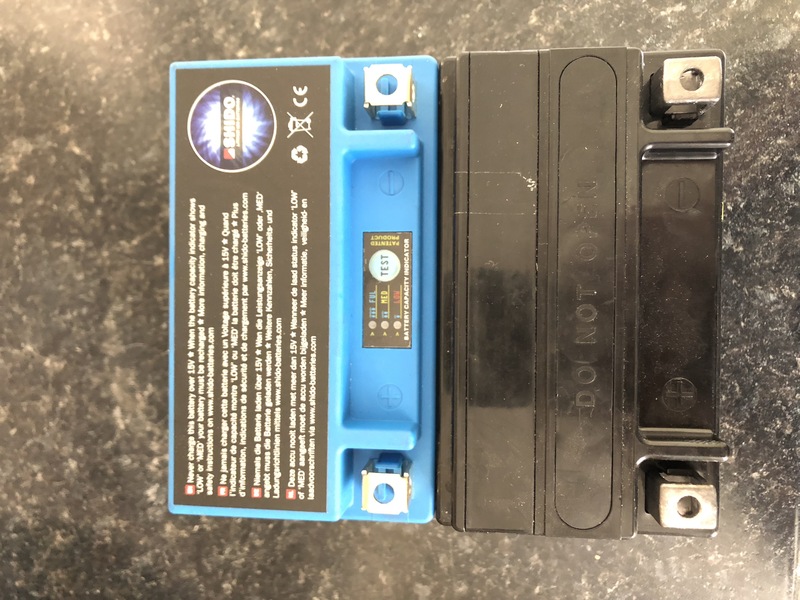 Put simply, compared to conventional lead acid batteries which consist of heavy lead plates submerged in a bath of sulphuric acid (H2SO4), Lithium-Iron (LiFePO4) batteries comprise of much lighter lithium and graphite. 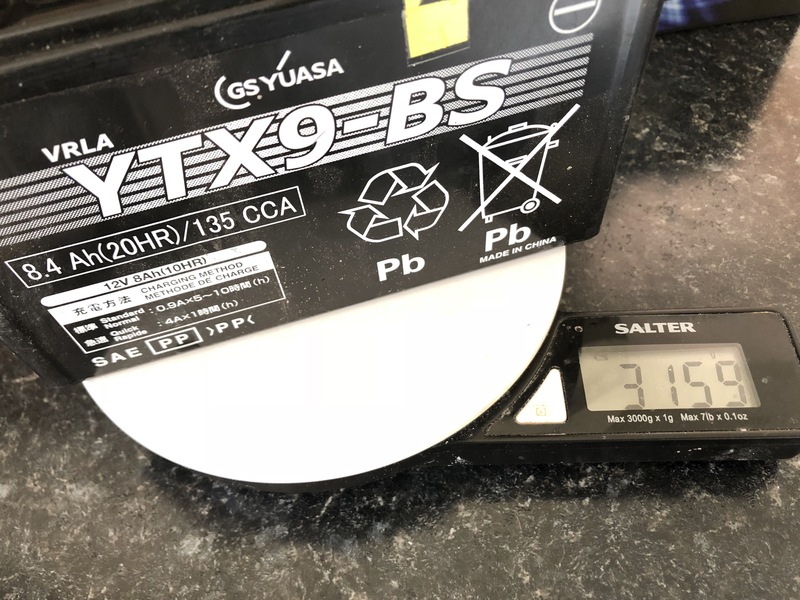 Therefore they weigh a heck of a lot less, pack a much higher power density, suffer less discharge-over-time issues, can withstand more recharge cycles and, now cost about the same as a lead-acid battery. And, they’re far more environmentally friendly as they don’t contain any heavy metals (read: lead). Seems like a total no-brainer to us. Of course, Lithium batteries aren’t exactly new in the world of motorcycles. For at least a handful of years you’ll have found lads running in the fast group at track days running lithium batteries usually made by Shorai or Ultrabatt. 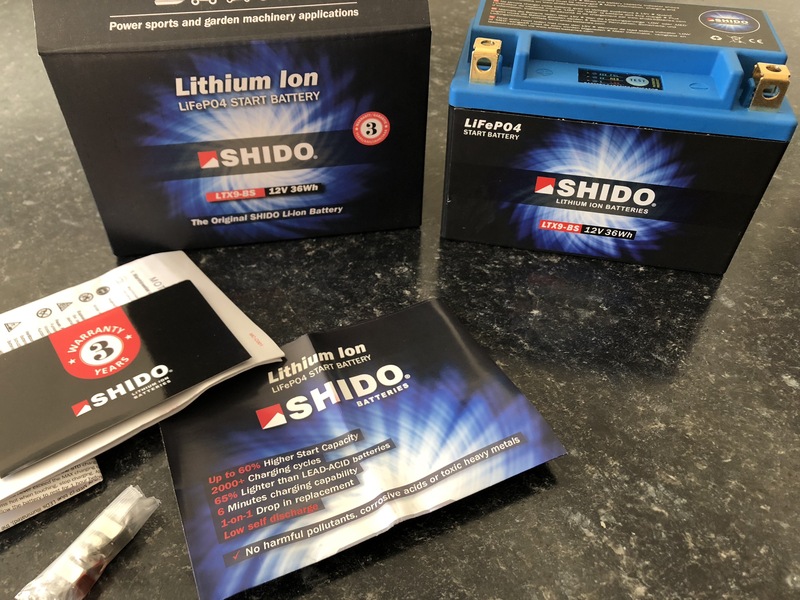 The difference compared with the latest and greatest Lithium-Iron batteries is those Shorai or Ultrabatt batteries come in odd shapes and sizes meaning they won’t simply fit into your existing battery box compartment. What’s more, they often require linking together in parallel depending upon how much capacity you need – in other words, they’re perhaps a bit of a faff. But now, the newest Lithium-Iron batteries are coming in standard sizes, meaning they’re a drop-in replacement for your standard lead-acid battery. Do a quick search online and you’ll almost have to go out of your way to find a lead-acid battery. 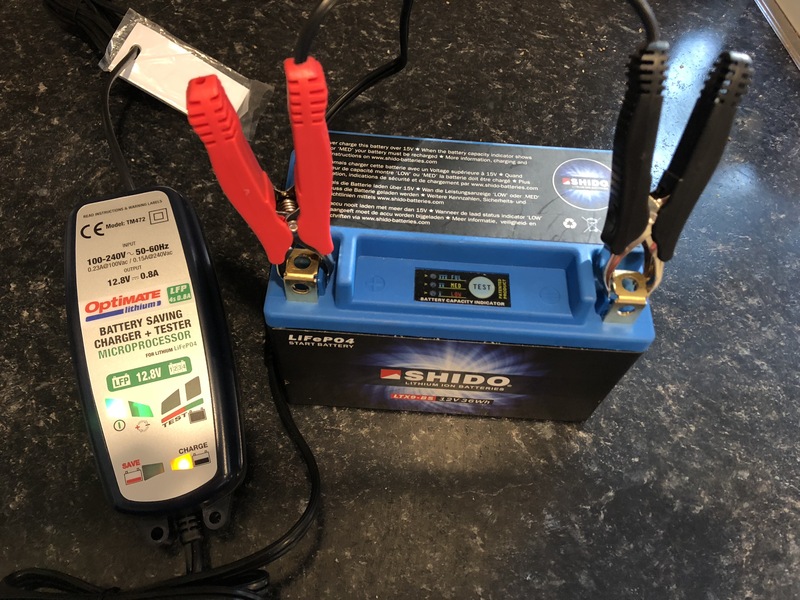 To test the ease of use and other claimed benefits over ye olde lead-acid batteries, we put one of Shido’s Lithium batteries on long-term test to see if it was any good or not. We chose the LTX9-BS which is a replacement for the ultra-common Yuasa YTX9-BS. You’ll find a YTX9-BS in almost every ‘big bike’ going – from Gixxer Thous to Street Triples to your dad’s bashed up VFR750. Other models are available too for bikes with bigger, more capacious batteries. Standard stuff. Nothing amazing to see here, just some paperwork and some spare battery terminal nuts and bolts. First things first, it needs charging. There is a catch with Lithium-Iron batteries, and that’ll be the fact you can’t charge them with a standard lead-acid charger. Well, ok, you can, but it isn’t recommended in the slightest, and should be a last resort. 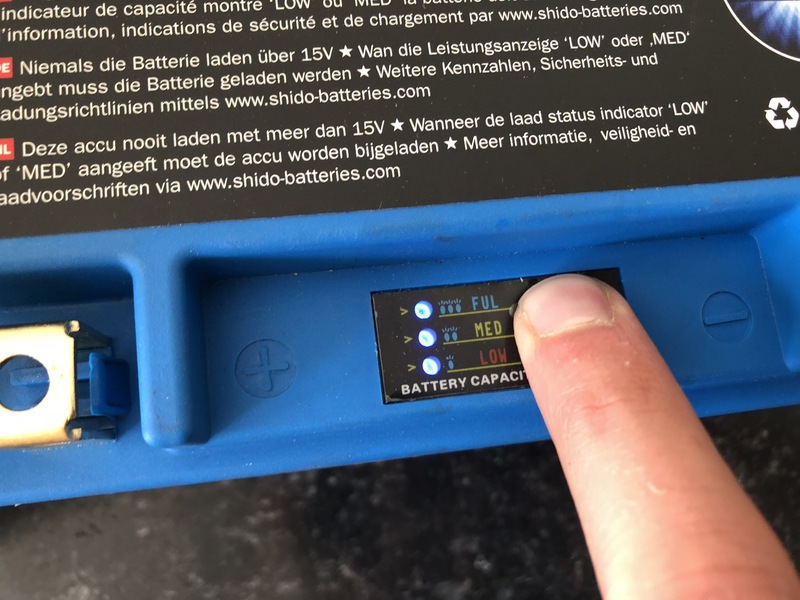 Lead-acid batteries tend to need ‘shocking’ back into life via a healthy amount of volts, where as Lithium-Iron batteries need a very gentle trickle to get them back to a healthy, working state. Another point worthy of note is Lithium-Iron batteries do not suffer from sulfation, and most lead-acid battery chargers will run through a desulfation programme which will damage a Lithium-Iron battery. 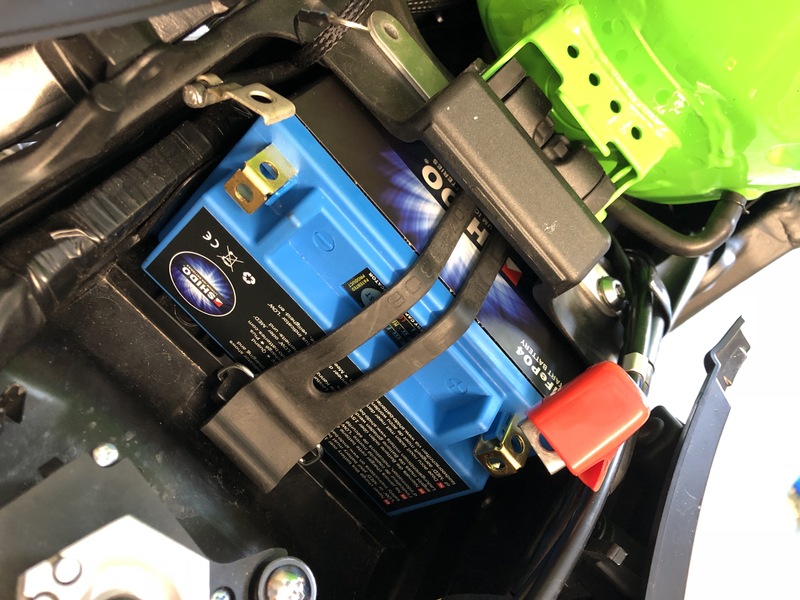 For us at Superbike, there’s only one choice when it comes to chargers, and that’s Optimate who’ve been looking after our batteries for as long as we can remember with clever micro-processor controlled charging technology. They offer two Lithium battery chargers, and we opted for the Optimate Lithium 0.8A model. There’s a beefier 5A model available too (good for total-loss systems in need of a full charge between track sessions), but the 0.8A is perfect for every-day use. A useful feature in theory, but perhaps not in reality when the battery is buried deep inside your bike. If you’ve got a bike where the battery is more readily accessible, perhaps this’ll be a more useful feature. And just before installing it, time to break out the scales. 3,159g vs 869g. We can’t think of a cheaper way of shedding 2,290g. That’s a huge reduction in weight, and also a reduction in weight and your bike’s centre of gravity due to most batteries residing under the seat. We then set about installing the LTX-9BS into our 2015 Kawasaki ZX-6R 636. As you can see from the following photos, it dropped straight in nice and easy, and with no faff whatsoever. Unlike a lead-acid battery, there’s no acid to deal with or any of that nonsense. We didn’t bother using the new nuts and bolts supplied, we just used the ones already on the Kawasaki. Then – the easy bit – all we had to do was live with it for a few months. Immediately you can feel the reduced weight when riding – as mentioned, shedding ~2.2KG is no small amount of weight to lose (especially for such a small amount of money), but you can also feel the extra oomph in the Shido when starting the bike as compared to the lead-acid Yuasa; the Kawasaki’s motor definitely spins over faster, and just as enthusiastically on repeat starts (especially noticeable when repeatedly stopping and starting the engine while queueing to get into an event). We measured discharge on the Shido vs the Yuasa over a series of fortnights. 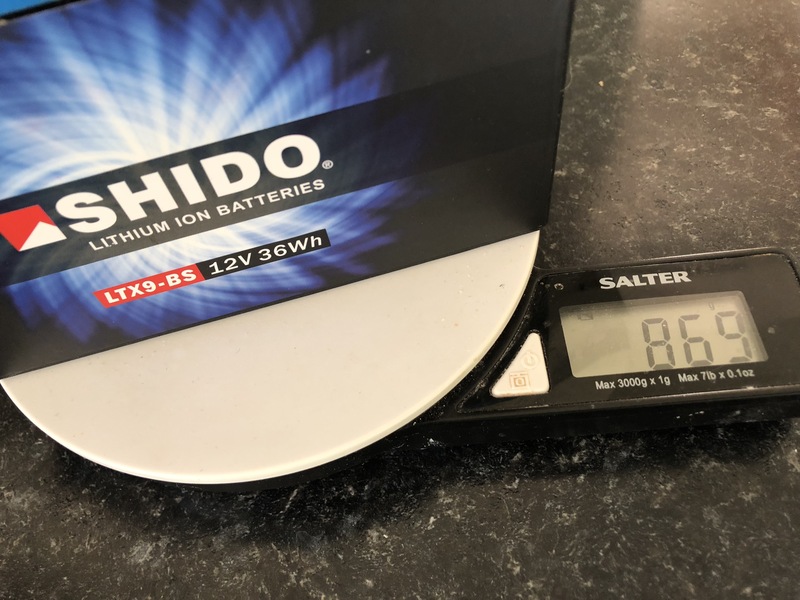 On average, over four sets of 14 days, the Shido would drop 0.02 volts, and in one case, actually gained 0.04V (but we’ll put that down to temperature differences given the belting summer we’re having in Britain). By contrast, the Yuasa would drop 0.25V consistently every 14 days. Suffice to say, the Shido didn’t really ever need charging. 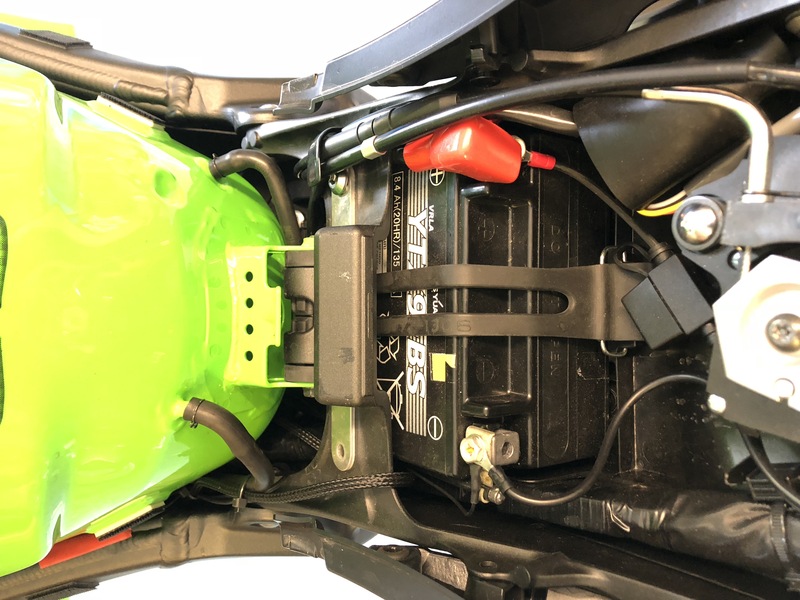 It’s also worth noting that our test bike does not have an alarm system fitted, and voltage readings were taken with the battery out of the bike and not connected to anything. In short, we had no problems with the Shido battery. It starts and spins our bike over with more vigour and enthusiasm than the lead-acid equivalent, and weighs 2.2KG less… and all for ~£55, plus a charger at ~£50. We’ll let you know how our continued usage goes, but thus far, we’ve nothing to moan about whatsoever. If you’re in the market for a new battery or simply want to find the cheapest and easiest way possible to shed a couple of kilos off your bike, this is certainly a great way to go.